Fullbright's follow-up to Gone Home felt like interactive theatre. 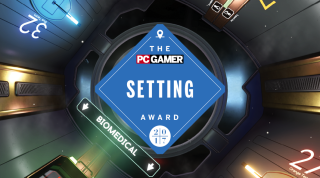 PC Gamer's Best Setting award for 2017 goes to Tacoma, as voted for by our global staff. As a reminder of our process, we pick the games we want to champion, then select an award title that suits them. Check out the other GOTY winners here. Philippa Warr: I still haven't settled on a preferred description for Tacoma. Set on a space station, Fullbright's mystery story unfolds in a way not too dissimilar to Gone Home, with you following a pathway through a space and using a collage of information from the past to build up your understanding of what's happened prior to your arrival. Rather than replicating that experience and moving it into orbit, Tacoma swaps the sense of going through a box of memories for a rich and rewarding kind of interactive theatre. The most obvious element of that is the ghostly collection of crew recordings, but supporting, elaborating and enriching it is the phenomenal set dressing and the environment design. These spaces feel… right. They feel inhabited and they feel functional. Crew quarters impart clues as to relationships with people on and off the ship, particular objects point to vulnerabilities, strengths and passions in characters, coffee rings and hair bands and nail varnish are all mundanely humanising. I don't want to talk in specific terms because every object is a potential delight and a repository of stories. Instead I'll settle for two more general pleasures. One is that I really loved finding objects which provide the answer to an earlier question—an email or a note explaining how something came to be in another crew member's possession, or the missing part of a set of things which tells a story through its placement in the world. The other is that the private rooms aren't discrete units of space. I touched on that earlier in mentioning how they help describe a world and a web of relationships extending out from that person. But, more specifically, you are increasingly aware of how the spaces reflect the extent to which the inhabitants are bonded to one another. Some are more rigorously private, while others coalesce beautifully and spectacularly. There’s true joy in seeing the characters' vulnerabilities this way. Andy Kelly: It's in the mundane detritus of everyday life where Tacoma's depth lurks. A photo of a loved one hidden away in a drawer, face down. A revealing letter tossed in a wastepaper bin. A particular book lying on a bedside table. These scattered, seemingly innocuous props are the key to understanding the crew and decrypting their lives and personalities. And, like the best science fiction, Fullbright's keen attention to detail—its consideration of how a station like this might actually function—makes it a compelling, convincing space. I can vividly imagine living on Tacoma, shooting pool in the common area, watching the stars from the observation deck. And I think this is why I find it so easy to relate to the characters and engage with the story. It feels real. Tom Senior: I was expecting relationship drama and certainly got my fill of rows and heartwarming revelations—I wasn't expecting an interesting vision of a futuristic civilisation. Science fiction futures full of powerful, manipulative corporations aren't new, but Tacoma puts a clever spin on the worker/employee relationship with a Loyalty system that indentures the crew to Venturis. The crew's individual situations are all shaped by this arrangement in some way, adding an extra layer of social commentary to the story you're hoovering up in email chains and chat logs. Tacoma is great because you can glean so much from a handful of rooms on a space station. The chat logs are sharply written and fun to scan using Tacoma's augmented reality UI elements, the props are beautifully built and meticulously placed in Tacoma’s detailed capsules. I'm glad I took the time to dig into every drawer and discover the crew's hidden lives. Joe Donnelly: For me, the most appealing game worlds are the ones that make you, the player, feel insignificant. Upon death in Dark Souls, for example, enemies promptly return to their beats—as if your presence was a temporary inconvenience or a distraction to their regular routines. Although very different in a variety of obvious ways, Tacoma's player-to-world relationship is similar. The events you spend your time filtering through in Fulbright's Gone Home follow-up have already taken place, meaning that while playing, rewinding and repeating its segments of dialogue, the player has little control over the direction of the story. As outlined above by Tom, Andy and Pip, how you interact with the world's seemingly innocuous dressing informs your journey. Sifting through an NPC's emails is as likely to help you learn more about other characters as it is to help you uncover a lock door's keycode. Similarly, I loved following certain characters around the ship in the knowledge that the central narrative was unfolding elsewhere. By watching them perform trivial tasks, I gained a greater understanding of the quirks and idiosyncrasies of specific characters, their place in the wider story and setting and, ultimately, my own. For more Tacoma coverage, check out our review.